Page 3 of the 1895 Public Days program showing E.A. Craighill, Jr.
It’s fun to look at the document and realize how different the University was then. Most of the degrees are professional or graduate degrees because the four-year bachelors degree was virtually unknown then. 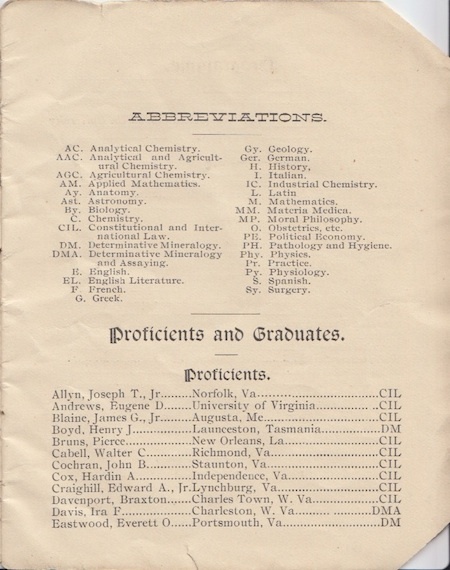 It wouldn’t be until a few years later that curriculum reform at Virginia and other universities standardized the four-year undergraduate degree that we are all familiar with today. I posted scans of the whole thing to Flickr; enjoy.